I Me My: Mieville's "Embassytown" Reveals the Potency of Language. Mieville's "Embassytown" Reveals the Potency of Language. ‘Embassytown’ by China Mieville was a very difficult and perplexing read; yet, there was something about it that would not let me abandon it. Science Fiction has not been one of my favorite genres in recent years. Complexity of plot and more so the discomfort of being transported into an alien world, has made me distance myself from this genre. Embassytown, a sci-fi novel, was no different, but it held my attention and my interest. 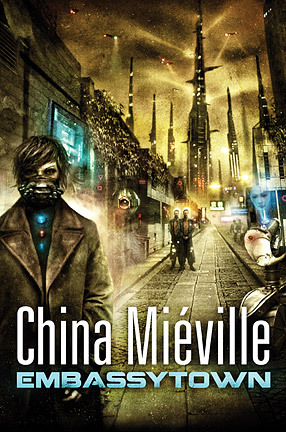 Although I had to re-read several chapters of it, some more than once, to comprehend what was happening and to decipher meanings of words and phrases that Mieville coins throughout the novel, I quite enjoyed the challenge this book offered. The setting of the novel is Embassytown, a city located on a remote planet that has been colonized by humans, but continues to be home to the native Ariekei, an intelligent species who speak a language that expresses only that which is true or factual. The city is a diplomatic enclave and hosts different alien life forms including humans, some of who are ‘ambassadors’ as they can communicate in the Arikei language. During the course of the novel, however, the Arikei learn to lie, and develop an addiction to this new language of lies and will resort to extreme violence if deprived of this new-language stimulus. The story is from the point of view of Avice, “a human colonist who has returned to Embassytown after a deep space adventure. She cannot speak the Ariekei language, but is ‘an indelible part of it, having long ago being made a living simile in their language…a language she cannot speak – but which speaks through her, whether she likes it or not.” It is on her return to Embassytown with her linguist husband that the story really begins. Avice, though a facilitator for the ‘ambassadors’, is not an insider to the developing situation in this diplomatic colony, where a new speech is being introduced to the Ariekei through a ‘new ambassador’. What results in the aftermath of the ‘introduction’ is violent, frightening, and appears unretractable as Arikei society starts falling apart and diplomacy seems to have fled Embassytown. This novel is definitely a must-read for sci-fi enthusiasts, but I would also recommend it to language lovers. The power of language is very strongly felt as the Ariekei speech-experiment unfolds. Additionally, Mieville has carried out a ‘reverse personification’ in his characterization of Avice, the protagonist and narrator; I've never read/seen anything like this before. This novel is definitely not an easy read, but it can't be set aside once you start reading it. It sticks; in fact, it is still resonating in my 'consciousness'. thank you. i havent had a good book review in ages! will put it on my reading list. I will tell my husband about this book as I think he would really enjoy it! Delhi Monsoon - Just Let it Rain!